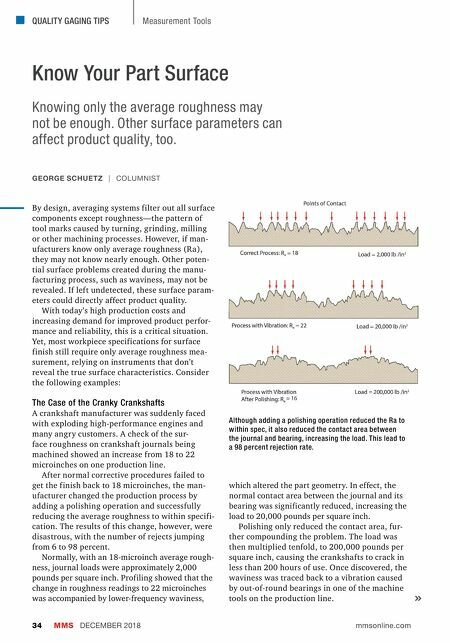 MMS DECEMBER 2018 34 mmsonline.com QUALITY GAGING TIPS Measurement Tools Know Your Part Surface GEORGE SCHUETZ | COLUMNIST Knowing only the average roughness may not be enough. Other surface parameters can affect product quality, too. By design, averaging systems filter out all surface components except roughness—the pattern of tool marks caused by turning, grinding, milling or other machining processes. However, if man- ufacturers know only average roughness (Ra), they may not know nearly enough. Other poten- tial surface problems created during the manu- facturing process, such as waviness, may not be revealed. If left undetected, these surface param- eters could directly affect product quality. 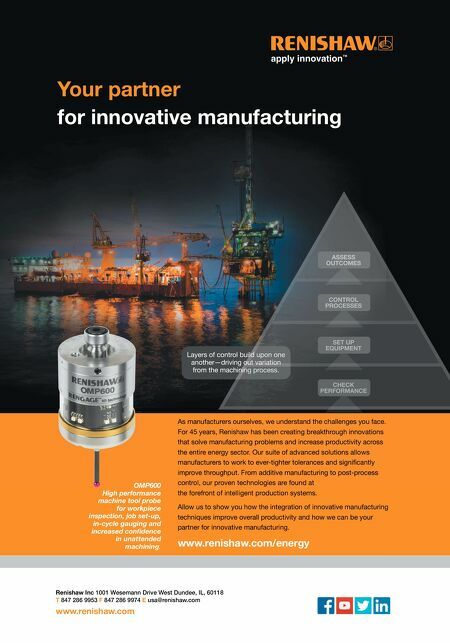 With today's high production costs and increasing demand for improved product perfor- mance and reliability, this is a critical situation. Yet, most workpiece specifications for surface finish still require only average roughness mea- surement, relying on instruments that don't reveal the true surface characteristics. Consider the following examples: The Case of the Cranky Crankshafts A crankshaft manufacturer was suddenly faced with exploding high-performance engines and many angry customers. A check of the sur- face roughness on crankshaft journals being machined showed an increase from 18 to 22 microinches on one production line. After normal corrective procedures failed to get the finish back to 18 microinches, the man- ufacturer changed the production process by adding a polishing operation and successfully reducing the average roughness to within specifi- cation. The results of this change, however, were disastrous, with the number of rejects jumping from 6 to 98 percent. Normally, with an 18-microinch average rough- ness, journal loads were approximately 2,000 pounds per square inch. Profiling showed that the change in roughness readings to 22 microinches was accompanied by lower-frequency waviness, which altered the part geometry. In effect, the normal contact area between the journal and its bearing was significantly reduced, increasing the load to 20,000 pounds per square inch. Polishing only reduced the contact area, fur- ther compounding the problem. The load was then multiplied tenfold, to 200,000 pounds per square inch, causing the crankshafts to crack in less than 200 hours of use. Once discovered, the waviness was traced back to a vibration caused by out-of-round bearings in one of the machine tools on the production line. Although adding a polishing operation reduced the Ra to within spec, it also reduced the contact area between the journal and bearing, increasing the load. This lead to a 98 percent rejection rate.